Situated in Barge Park in Maunu, Whangarei's Riding for The Disabled is a, not-for-profit organisation which provides opportunities for anyone with a disability to enjoy safe, healthy, stimulating, therapeutic horse riding and horse-related activities, including Recreational Riding, Therapeutic Riding, 'Equine-assisted' or 'Equine-facilitated' Psychotherapy and Hippotherapy (which literally means treatment with the horse. Operating since the 1970's, and in its current location since 1994, RDA is a wonderful place to spend a couple (or more) hours. It's a lively place, with 2 covered arenas, stable complex, a classroom with spacious covered deck with kitchen and amenities. They also have a thriving plant shop. RDA operates Monday through to Thursday 8.30am – 3pm, the facility caters for up to 90 riders a week, Rachel Ball, Manager of RDA says, “Volunteers are the life line of our organisation, but we are now at a critically low point, as there is a rider waiting list”. Rachel also stresses that you don't have to be “horsey” to help. “There are heaps of ways that people can help us, and we can teach you all you need to know”. Whangarei RDA have 7 horses at present, the focus is in the stables getting the horses geared up and ready for their riders in the morning along with helping in the arena to lead a horse, or to sidewalk with our riders, and at the end of the day, gear, and horses to put away along with housekeeping. Experience again is not necessary as full training will be given. Rachel points out that fitness levels are no barrier to volunteering, as while you can certainly get a workout leading the horses and mucking out during the day, they also need helpers as greeters, morning tea makers, gardeners, cleaners, and general maintenance. 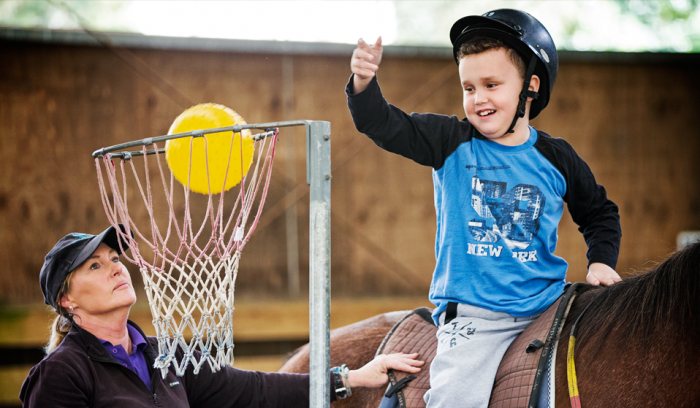 Whatever your ability, RDA has something to suit everyone. They offer a great atmosphere with lots of fun and laughter, where we see you as a valued member of our team, it's very enjoyable and rewarding.